A metal garage kit is a great addition to any type of property because it’s affordable, durable and can be quickly put in. However, many property owners do not consider this feature because they do not know a lot about garage buildings. Our goal is to educate you on the benefits of these structures; how durable they are, how cost-effective they can be and how you can utilize them for your residential or commercial property to get more use out of it and maybe even generate or save money. is relatively cheap, quickly install a steel structure on it and start saving immediately. Durable garages building: The first thing you need to know about these metal units is that they are built to withstand a lot. For example, these units are tested against hurricane-force winds up to 200 mph and they stand tall. They have been tested and pass Florida and Texas hurricane wind force standards as well as California seismic earthquake challenges as well. In fact, what they do is bend a little which forces the strength of the wind downward to the base where the unit is its strongest. Along with that, they are designed not to crack, to resist corrosion and they also do not have to worry about infestation of termites. These are all features that you can rely on and expect this unit to last for decades. Garage buildings can be installed quickly: Installation time is important, especially when you are pressed for time. Because these units arrive read to assemble, our expert crews will be able to handle the installation quickly, saving you time and money. Being able to install garage buildings quickly is important if you are doing it to save money, in preparation for hurricane season or you are starting a new business. Our crews work fast and will make sure everything is installed quickly, safely and up to code. Garage kit prices: Depending on what you are looking for; 3-car, 2-car or a different design, the cost for these units is going to be far less than you would pay for a different type of material like concrete or wood. For example, Eversafe steel garage kit prices require less labor costs and cost in materials as compared to concrete which not only requires the concrete but also requires rebar, wood and cinderblocks. If you are working with a tight budget, then why not go with the option that’s faster and more affordable while still providing you efficient quality that you can rely on for years to come? Multiple uses: Again, it is the usage of these steel garages building units that make them valuable to you. Whether this is something you are putting near your home or a commercial property, it can help you to save money and even generate revenue. For example, if you own commercial property that is lying dormant and not being used for anything, you can quickly assemble these steel units on the property and rent them out to start making money off the land that was otherwise not doing anything. Remember, there are dozens of options to choose from with these metal garage buildings and you want to make sure that you go over all of the options that will fit in the area you have available. You may be interested in a 3-car unit only to find that the 2-car unit provides more room for an office or extra storage space. Researching your options is the best way to ensure that you are happy with your decision. 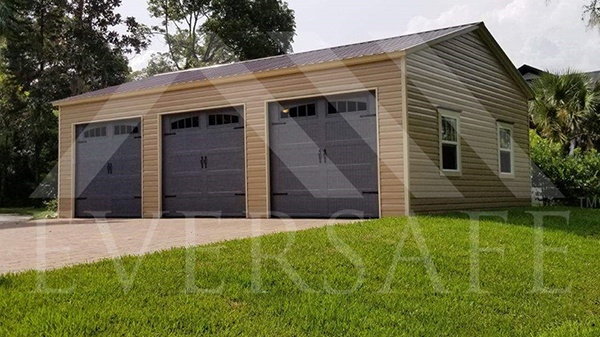 Eversafe metal garages buildings are a great addition to your property. You can check out information on these units and get a free quote directly from our site. If you need assistance with ordering, pricing or anything else, you can contact our experienced team for further assistance. Be sure to ask us if there are any specials or clearance units that are available as well to increase your savings even more. We are excited to show you why Eversafe units are the best in the industry and how you can make your purchase with confidence.